Another discount domain registration from eShop Hosts, .biz domain registration is now only £5.99 for the first year until the end of June 2012. Register a .BIZ domain name at eShop Hosts and get £3.00 off our normal domain registration price. 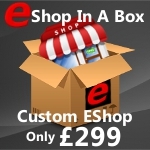 eShop Hosts can only offer this amazing £3.00 Off .BIZ domain registration Special Offer until 30th June 2012 and is available to both new and existing eShop Hosts customers. The domain extension .BIZ domain extension general top-level domain (gTLD) in the Domain Name System of the Internetn and was created with the intention that it would be used for the registration of domain namess for use by businesses. The BIZ name is a phonetic spelling of the first syllable of business. Since the .BIZ domain was first made available to register in 2001 as an alternative domain extension for businesses whose preferred domain name with the .com extension had already been registered, there have been well over 2 million domains registered. Get the following features Free when you register Any Domain Name at eShop Hosts. Get 2 Email Accounts hosted for FREE and packed full of free features and services including Spam and Virus protection, DNS management and a whole host of other free features. Great for anyone wanting to utilise some function from their domain name that isn’t being used on a hosting account. Choosing the right Domain Name for your online venture can be the key to a having successful web site and E Shop Hosts are offering you the opportunity to register a .BIZ Domain name at the discounted cost of only £5.99 for the first year. Thats a saving of £3.00 or 33% off our regular price! Remember, this is a time limited Offer! This offer for discounted registration of .Biz domains will be available until June 30th 2012. So What are you waiting for? Order Your Discounted .BIZ Domain Today!